Let me give you a great recommendation for Mother’s Day this year, L’Occitane’s famous shea butter range is amazing, they’ve got some really cute gift packs in their stores this year and I’ve already got one for mine (it wasn’t going to be a suprise, don’t worry). 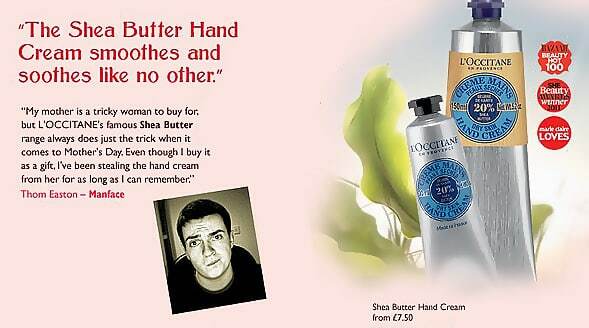 I love their Shea so much, they included me (and 3 other great bloggers) on their mail out and Facebook Page letting the world know how much I rock their range which was very nice of them… although my name was spelt wrong… but it was still lovely. Trust me, their hand cream (and other products) are some of the best out there and come from the heart of the French Provence. This article first appeared on MANFACE written by Thom Watson. It was published on Wednesday 14th March 2012 and was last updated on Monday 3rd April 2017 at 4:26pm. It's categorised under Body, L’Occitane where you'll find more related content.